Jute tote bag from the Marriott Vacation Club. Never used and still has tag. Approx 13x23x7 inches. Double handles and inside zippered pocket. 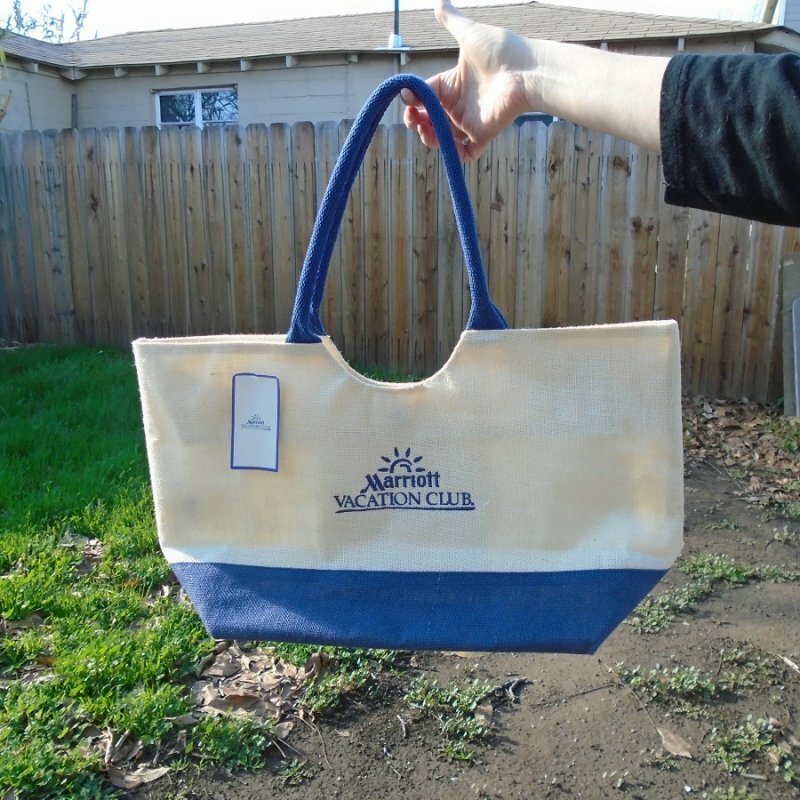 I purchased this Marriott Vacation Club tote bag recently at an estate sale. It has never been used and still has the tag attached. It is light beige and navy blue in color. It has a snap closure. It measures about 13 inches high, 23 inches long, 7 inches front to back and has double handles. The inside has a single zippered pocket. It is made of Jute so that years down the road when it is no longer usable you can throw it out and it naturally decomposes. It's the perfect accessory to take to the beach, or shopping, or to the airport for a carry-on piece. There are numerous usages for a tote like this. Google will not include items in their search pages unless a shipping charge is stated or unless calculated shipping is offered. Calculated shipping is very often quoted incorrectly so I choose to post a charge using the east coast as the destination. If you live in or near California, your charges may be less and if so I will refund a portion of those charges. If you feel uncomfortable with that, just send me an email with your zipcode and I'll quote you an exact delivery charge. That being said, buyer to pay no more than $9.95 for Insured USPS Priority Mail delivery charges, again, possibly less depending on your location.